You can add additional content to the bottom of each page on your website. It will be displayed above any other footer sections like widgets, newsletter or copyright area. Why you may need this feature? Because this allows you to add ANY content to the footer not just widgets like in other themes. You can build content on specific page with columns and shortcodes and then simply output it in footer. You can add additional content in the textarea or choose a specific page with you content. Linking page requires if you’ve build your content with WPBakery Page Builder and set some custom design options. Because in WPBakery Page Builder design options works only on the page where the content was created. You can enable newsletter section in the footer. You will need to install and activate Mailchimp for WordPress plugin if you have skipped theme Setup Wizard. Also you need to connect this plugin with mailchimp by adding your api key and create a form. After that choose that form in Footer newsletter settings of our theme. Newsletter section will be displayed above the footer widget area. 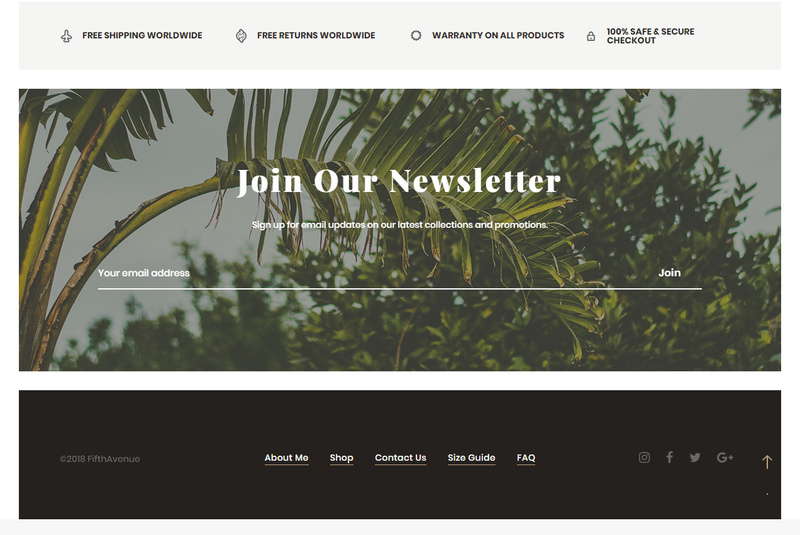 You can adjust appearance of this section in Customizer – Footer – Footer Newsletter. You can enable Widget area in footer and choose from predefined layouts with different amount of columns. The more columns in layout the more widget areas will be create in Appearance – Widgets. On example below you can see only one footer widget area ( “Footer area 1” ) since one column footer layout has been chosen in theme options. Now you need to add widgets to your widget area. Simply drag desired widgets from the left side where it says “Available Widgets” to the widget area (it is “Footer area 1” on image). You can choose between four different copyright area layouts, enable social icons and add any additional content to copyright area. Layout option change position of menu, additional content and social icons. Menu for footer can be assigned in Appearance – Menus. Create your footer menu and select Display location as Footer Menu. Appearance of the footer area can be adjusted in Customizer. You can change colors and other style settings separately for footer & widgets, copyright and newsletter area. 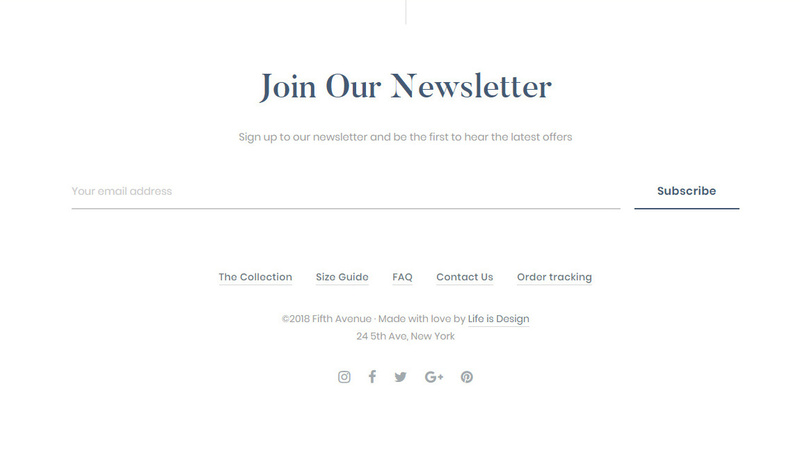 Customizer settings: Newsletter Flat input style, removed spacing between input and button, padding top and bottom 130px, white style, small form, background image without overlay. Full Width Footer Widget and Copyright Area – Enabled in Theme Options. Copyright area layout 3 with enabled social icons. 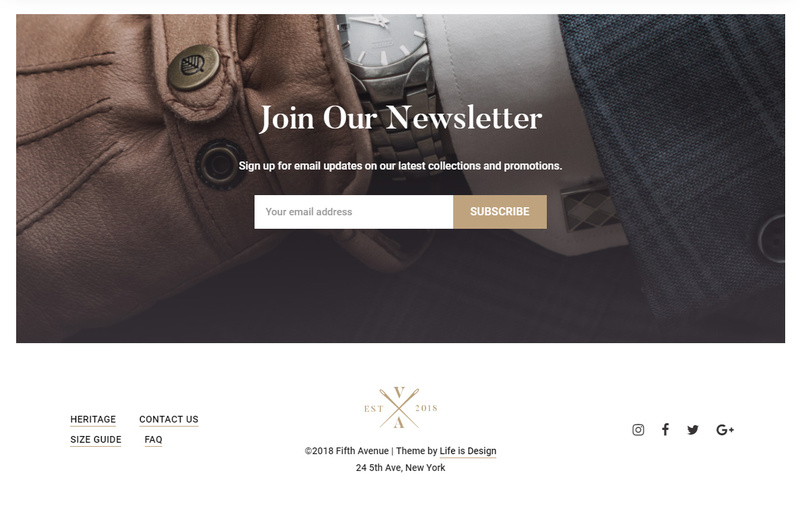 Customizer settings: Newsletter Underlined input, removed spacing between input and button, padding top and bottom 130px, white style, wide form, background image without overlay. Copyright area layout 4 with enabled social icons. 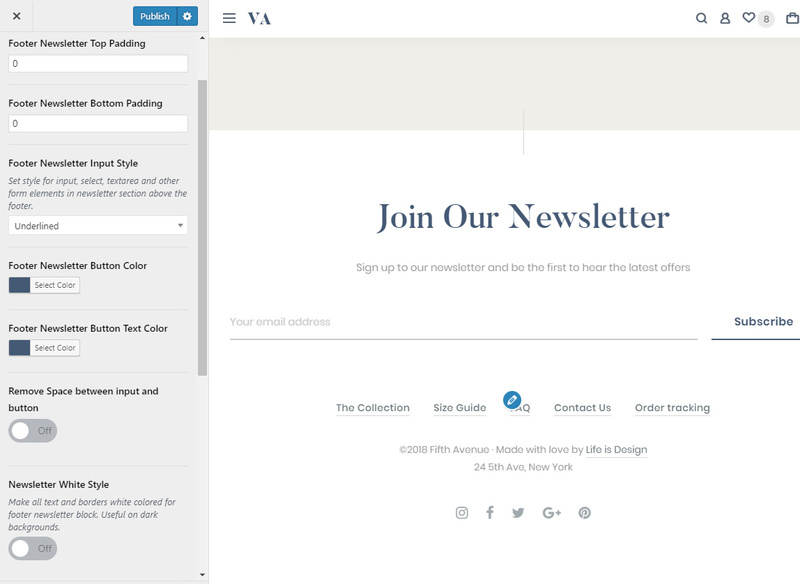 Customizer settings: Newsletter Underlined input style, padding top and bottom – 0px, wide form. 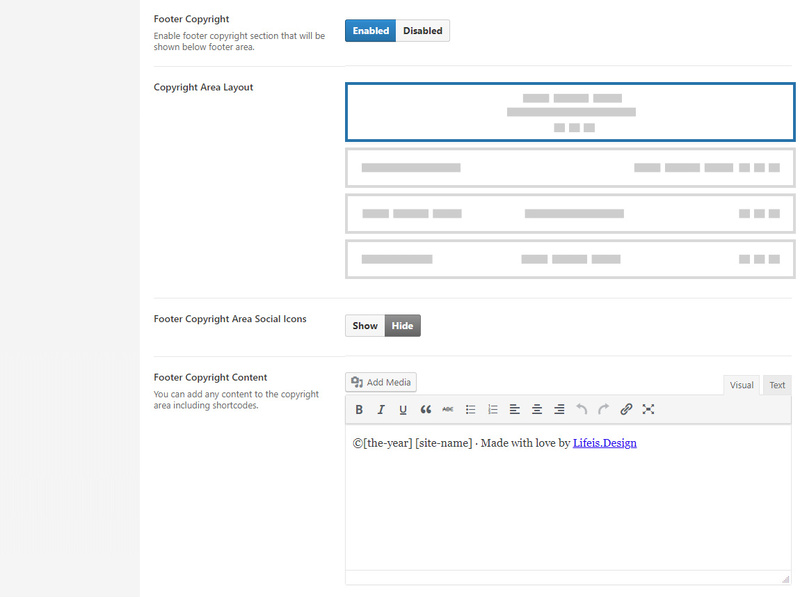 Full Width Footer Widget and Copyright Area – Disabled in Theme Options. Copyright area layout 1 with enabled social icons. You can disable footer and copyright area separately on any specific page or post. Open your page and look for Hide Footer and Hide Copyright Area options in Page General Setting metabox just below the content editor. Hide Footer will hide everything but copyright area, this includes additional content, widget areas and newsletter section.